Quattro™ Air Mask from ResMed is a CPAP Mask designed for greater comfort and better sleep. 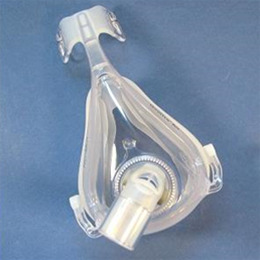 The ResMed Quattro Air is a Full Face Mask for CPAP that is lightweight and easy to use. Designed with only four parts, this Lightweight CPAP Mask for sleep apnea patients is easy to fit, wear, and clean. One replacement frame system for the ResMed Mirage Quattro™ Air Full Face Mask. This frame system includes the mask frame, cushion, and swivel elbow. It does not include the headgear.